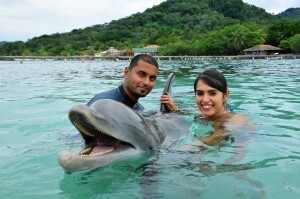 Welcome to Roatan, Honduras | We LOVE Roatan Blog!! I finished university in Canada in 2006 and have been on a mission ever since to travel the world. Seeing it all and doing it all! My travels have taken me all through the Caribbean, North America, South America, Europe, Asia and Africa- many times only on my wits and a shoe string. In that time I have dove with great white sharks in South Africa, swam with whale sharks in Mozambique and Roatan, traveled by train from Himalayans to the most southern tip of India , sailed the Caribbean and Mediterranean seas , went on a 2500 ft sub expedition into the abyss, made amazing friends and had countless other misadventures! I ended up travelling to Roatan 3.5 years ago and it has become my new home. Anyone who has been here can tell you, Roatan has a magic like nowhere else. Where else but Roatan can you snorkel right off a perfect white sand beach, or scuba dive in a reef where you can see down 12 stories. The ocean in Roatan contains every type of sea creature imaginable, from rays, colorful fish, sea turtles and even the odd whale shark. Unlike other Caribbean islands, Roatan has mountains covered in lush jungle. From the sky it looks like an emerald amongst 50 shades of turquoise. Roatan´s real beauty lies with its people, gentle islanders with big smiles, laid back attitudes and a genuine hospitality that most of the Caribbean has lost. I hope this travel guide to Roatan will showcase the good and bad of Roatan from an insiders point of view and let you decide if Roatan is paradise on Earth or just another nice beach.